Bea Azaeli lives in the last existing city in the world, the only one not overtaken by the Erubii, a city that’s a remnant of conflict and hardship. She’s a cadet about to fulfill her dream to protect the city from the Erubii beyond the boundary wall as a sniper. Bea has just graduated with her best friend Gus, to become a coveted Dread warrior and will receive her true ink. The ink marks everyone with individual symbols or animals that slither visibly under their skin to reveal emotion and rank in society. But Bea is haunted by her father’s death and what happened to her mother. Now it’s only her and her sisters Joy and Abby. Joy has become a Stork, carrying a surrogate baby for the council which will help the sisters become financially secure. Younger sister Abby hasn’t spoken since their mother was taken. Then the crows come, and Bea’s destiny changes when she approaches the crow with the golden eye. Everything she has ever aspired for and understood starts to unravel when she meets Red, an Unwanted who shows her everything she’s ever known is a lie. When Joy needs protection, Bea must follow Red ­– whom she doesn’t trust, to save Joy and go against what she thought was the truth, even if it means alienating Gus. She doesn’t understand the hold Red has on her and the power he wields. 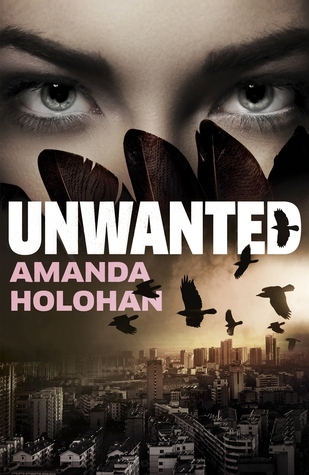 Unwanted is a well-plotted read that weaves dystopia, fantasy, action and suspense and some interesting characters that stay with you. The different tiers of society and the spaces they occupy are cleverly imagined. The concept of moving ink on people’s bodies is depicted beautifully, and is one of the major strengths of the novel. The ending is realistic and gives readers hope. Stay tuned for what’s in store for Bea in the sequel, Hunted, to be released in 2017. Will appeal to readers who enjoyed Divergent and The Hunger Games. Amanda is an Australian author and has also published The King’s Fool.